The syntax highlighting colors have changed. Here's a screenshot of some code taken from this post. System symbols have gone from black to blue, brackets from black to dark red, and user symbols have gone from blue to black. The old styles are closer to what is seen in-product, and it would be nice to have them back if possible. Why so red (and ugly)? I need to check how important it is but ® is gone. 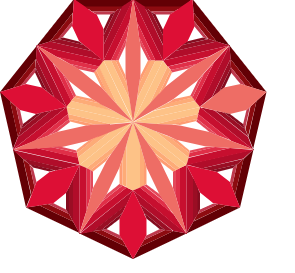 In particular, when I look at the site, I see many different red tones that not really work together. 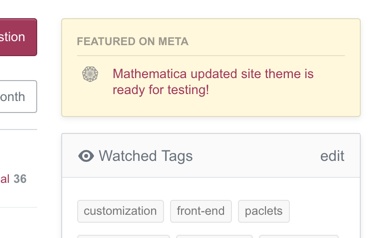 We have the new red of the MATHEMATICA, many reds in the logo, a different red for the "Ask Question" and the (un-)visited links, another red for the "Sign up for newsletter" button, and yet another red for the dot that indicates. Isn't it possible to introduce some consistency by reducing the number of different red tones? 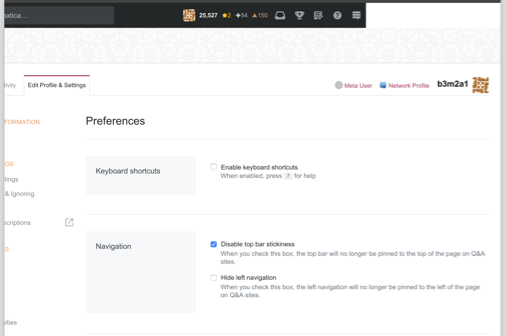 I already pointed out that our community is very creative, so please let us help to make the new design pleasing. 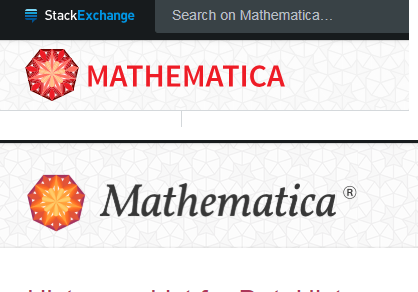 That being said, I went to the Mathematica webpage and looked up the two prominent red tones they are using and the font they used for writing "MATHEMATICA". With these, I re-created the complete logo and I manually hinted the font to make it pixel-perfect to a large degree. Below, I included a larger version of what I came up with and here you find a 260px wide version which is the size of the logo that is currently used in my browser. 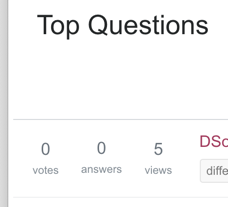 Also, I used the chrome dev tools to see how the reds look if we use these colors on the "Ask Question" button and the links on the page and to me, it is a drastic improvement to the current state (I saw on tex.SE that different colors for these are possible in the new scheme). My point is: Please let us be a part of the design process! We can provide e.g. a logo that was checked by many critical eyes and you don't have to do anything besides placing the SVG on the website. Suggestions for color? Ask us. And this has nothing to do with the sidebar that everyone hates. I just don't understand the reasoning behind letting someone design a new logo which is badly hinted and contains color errors, when there is a much easier way by just talking to us. Finally, if we do get a say in all this, I would volunteer to create the final logo based on the input of the community and the requirements from SE's designer. Graphics[p7 /. triangulate /. moretriangles /. shrink /. shrink /. Unlike many other sites (for example the Maths site), this site's logo isn't aligned to the pixel grid meaning the top and bottom are anti-aliased. This shouldn't be too hard to fix, and wouldn't change the size of the logo by much. Is it at all possible to get some padding on the LHS? Can this thing either flow up or be disabled? This thing is probably not doable, but while we're at it can I also hide the RHS bar? 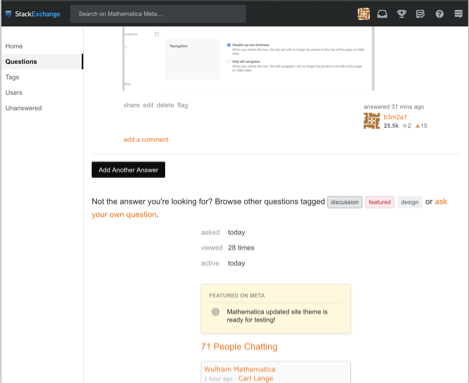 What should our site design look like? How is the appearance of the site determined? 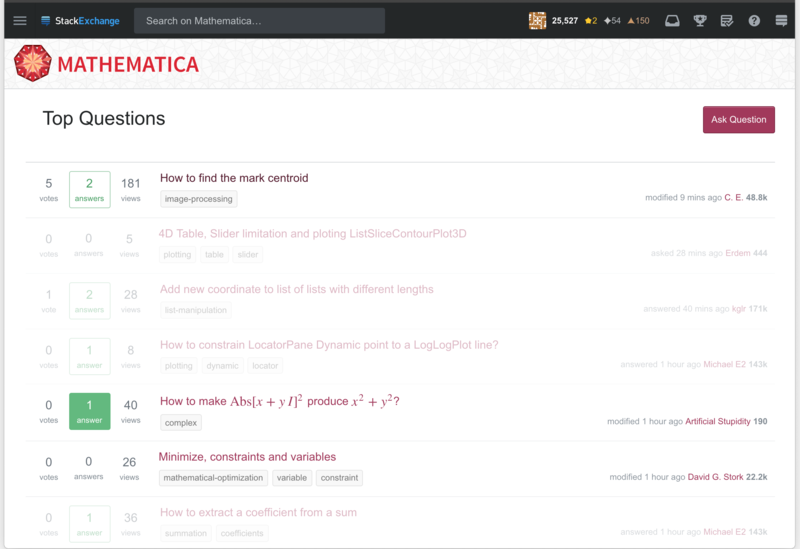 Mathematica self-evaluation: let's get critical!